Do you want to find out what are the best audiobooks you could listen to today? 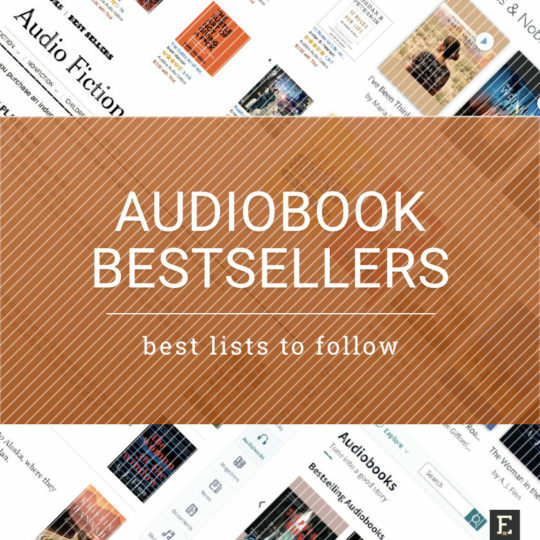 Explore the most popular audiobook bestseller lists. Audiobooks are on the rise. The more users are interested, the more tools become available to improve discoverability of the best performing titles. 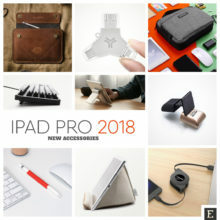 Lists that rank items according to sales figures are among the most convincing recommendation tools. 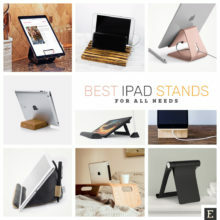 Customers simply vote with their wallets. Below, we’ve put together most popular audiobook bestseller lists from around the web. Among them, you will find weekly and monthly charts aggregated by the New York Times and NPD BookScan. 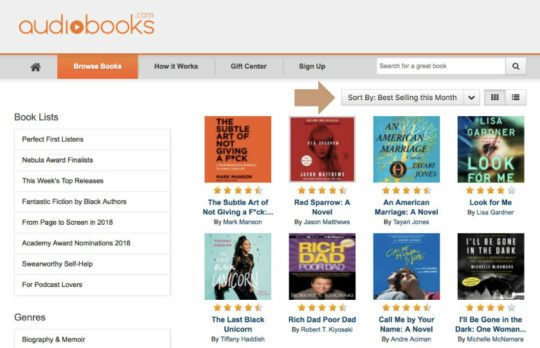 Platforms that sell audiobooks, naming only Amazon Audible or Google Play Store, also offer rankings based on sales. Sometimes, the book that enjoys big sales on one platform is not selling well on the other. That’s why it’s a good idea to compare featured titles between your audiobook store’s list and the list aggregating sales figures from several sources. The best destination is obviously the New York Times. Here is a round-up of the most popular and influential audiobook bestseller lists. Have we missed anything? Please share your ideas on social media. The New York Times Bestseller Lists are the world’s most important and influential rankings of top-selling books. In March 2018, the Times published Audiobook Bestseller Lists for the first time. Each one features top 15 books, based on combined digital and physical audio sales from the previous month. 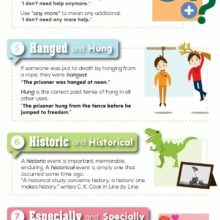 The information about each featured title includes the number of months/weeks on the chart, sales trend (up or down), reading time, and the name of the narrator. 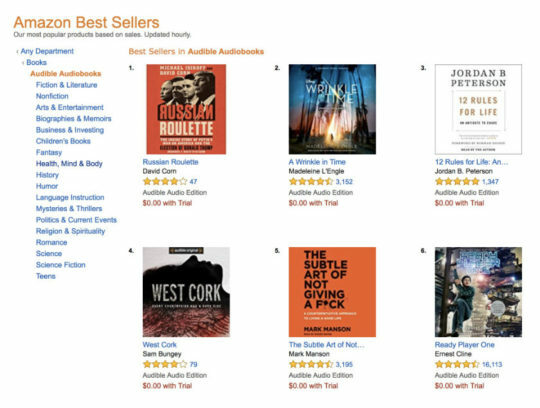 Just like other NYT bestseller lists, the audiobook rankings are based on a detailed analysis of book sales from a wide range of retailers who share not only the figures but also the specific and confidential context of their sales. The panel of reporting retailers is comprehensive and reflects sales in tens of thousands of stores of all sizes and demographics across the United States. Among many charts featured on Publishers Weekly, you will also find audiobook bestsellers. This simple list includes ten top-selling audiobooks from the last fully counted week. Besides the rank (current and previous), and the number of weeks on the list, the table includes a useful sales information – the number of units sold. Each title comes with two sales figures: the number of units sold in the current week, and the number of units sold since the beginning of the year. 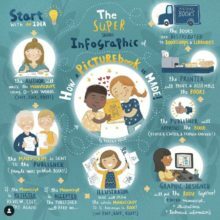 The ranking is supplied by NPD BookScan, a source of the comprehensive publishing data based on retail and e-commerce sales, as well as data provided directly by publishers. If you are looking for figures that would give you a hint of how big are sales figures for audiobooks, the Publishers Weekly list is the right place to check. 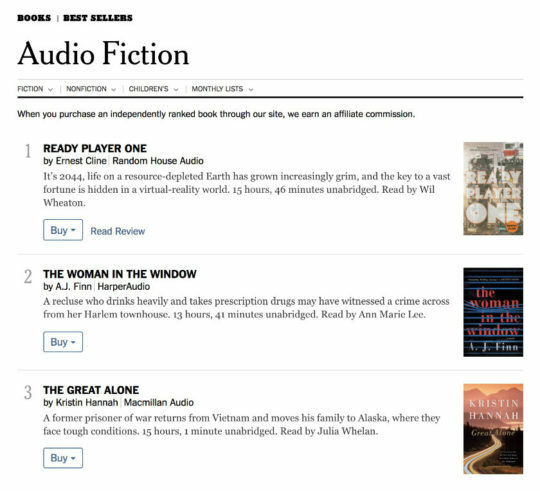 As Audible is an audiobook platform powered by Amazon, you can find audiobook bestseller lists on both sites. They are different, though. 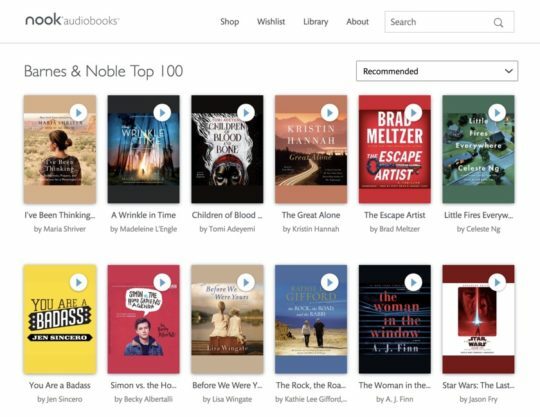 Amazon’s Best Sellers in Audible Audiobooks is organized the same way as Top 100 lists for print books, Kindle ebooks, and most other product categories. The list is refreshed a few times a day and ranks audiobooks that currently enjoy most sales. The order of titles can be different after you refresh the page in your browser! You can narrow down the number of displayed books by selecting your favorite category. There are sixteen main categories to choose from, including literary fiction, biographies, business, thrillers, spirituality, and language instruction. On the right side, you will find two other lists: Top 100 Audiobook New Releases and Top 100 Most Wished For Audiobooks. They could be useful if you are looking for insightful customer recommendations or would like to browse for newly released audiobooks. The bestseller list on Audible website looks similar to Amazon, but it’s a different list. One of the biggest benefits of Google Play Store is that it’s extremely easy to browse. 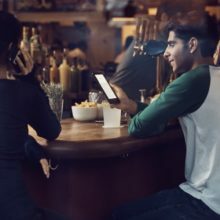 Google Play audiobooks were launched in January 2018. The audiobook section is organized the same user-friendly way as books or games. In the top navigation bar, you’ll find Top Charts. 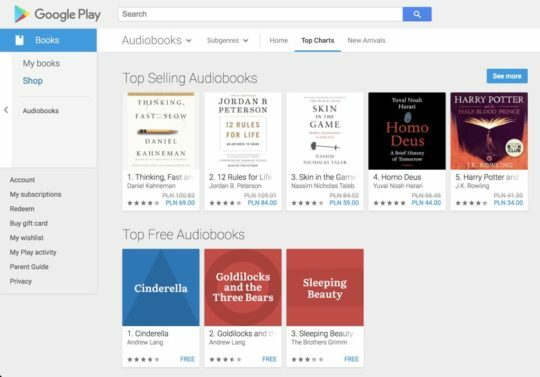 It’s an auto-generated list of the bestselling Google Play audiobooks. Here, you can explore top selling audiobooks in two main sections: paid and free. Each list includes up to 100 titles. You can easily narrow down the results by choosing “Subgenres” from the top navigation bar. Main categories are history, romance, science-fiction, and self-help. In some categories, you can even pick up the 2nd-level subgenre. Scribd offers subscription-based access to digital content. For a fixed monthly fee you will get unlimited access to ebooks, audiobooks, newspapers & magazines, as well as documents. You can explore Scribd catalog even if you are not subscribed to the service. To see bestselling Scribd audiobooks, enter the audiobook catalog of the store. 20 audiobooks that enjoy the highest sales are shown at the top of the highlighted sections. Each audiobook comes with the average rating, top reviews (they refer to all formats, not audiobooks, though), and the reading time. You can also listen to a sample right in your browser. Barnes & Noble offers audiobooks via the dedicated online store – Nook Audiobooks. 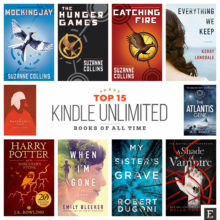 Most popular titles are featured on the home page, and the full list is revealed on Top 100 Nook audiobook bestsellers subpage. By default, you will see the titles sorted by the store’s recommendation, but you can also choose the publication date or title. A unique feature Barnes & Noble offers is the ability to listen to free audiobook samples directly on the bestseller list. There is no need to open the page with book’s details. Just click on the “Play” icon overlaying each audiobook’s cover. Kobo launched audiobooks in September 2017. Unlike Audible, the store doesn’t offer the list of audiobooks based on sales figures. However, if you are a Kobo user and consider getting an audiobook subscription, you can check out most popular titles on a list of audiobooks that are currently trending. It’s a simple list that displays 50 titles. We can only guess sales are one of the factors that are taken into consideration. The good thing is that under the Top 50 overall slider, you will find trending audiobooks in popular categories: literary fiction, biographies, mystery & thrillers, romance, young adult, and children’s literature. 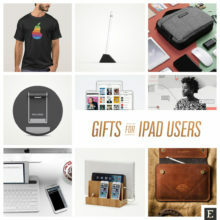 The store offers over 100,000 premium audiobooks, with 7,000 of them available for free. This default sort option is applied to any genre and subgenre, so no matter how far you’d want to narrow down the list of results, you’ll always see the bestselling audiobooks on top. 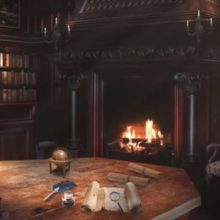 If you are the Goodreads user, you may be pleased to discover that you can find most popular audiobooks without leaving the site. To be clear, we are not talking about bestseller lists but the ones created and moderated by users. Among thousands of rankings in the Listopia section, you will find also several audiobook lists. 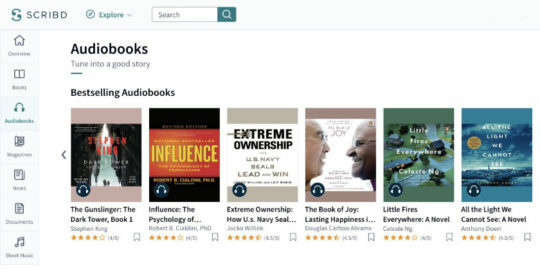 The most popular ranking, Best Audiobooks, includes over 1,200 titles, and almost 900 users have already added their recommendations. Other interesting lists are Best Audiobook Series, Best Audio Books for Road Trips, Easier to Hear than Read, and Best Free Audiobooks.